If the burgeoning number of grain-bowl restaurants sprouting up (sorry, couldn’t resist) is evidence of public demand, then healthy fast food is the wave of the future. Restaurants, food trucks, and stands that feature them are popping up all around the area. The trademark of these bowls, which makes them distinctly contemporary, is vegetable goodness piled prettily on a canvas of grains, brightened with unexpected flavors like pickled vegetables, Thai basil, and spicy dressings. These are not your mother’s (or grandmother’s) hippie bowls of dull brown rice with overcooked vegetables. A great grain bowl might have a base of brown rice mixed with quinoa, charred broccoli, smashed cucumbers, edamame, or shaved Brussels sprouts. Chickpeas fried to a crackling crunch, toasted nuts, currants, dried cranberries, spiced and roasted squash, or tofu resting on a bed of black rice or farro just scratch the surface of possibilities. In a restaurant that serves bowls, you typically go through a cafeteria-style line and choose a combination from the menu or build your own bowl. One established place, where everything that goes into a bowl is distinctive, is Whole Heart Provisions in Allston. When a tiny space next to Roxy’s Grilled Cheese became available in 2015, Roxy owner James DiSabatino and his partner, Rebecca Arnold, jumped at the opportunity to showcase her food. Arnold, who studied nutrition and worked in area restaurants such as Alden & Harlow and Sarma, wanted a place to reflect her passion for vegetables in a fast, casual setting. “I wanted to show how vegetables can be the star of the show and not pushed off to the side. Most customers are coming in for a meal, not even realizing that the restaurant is vegetarian,” says Arnold. Signature and build-your-own bowls are packed with surprises. 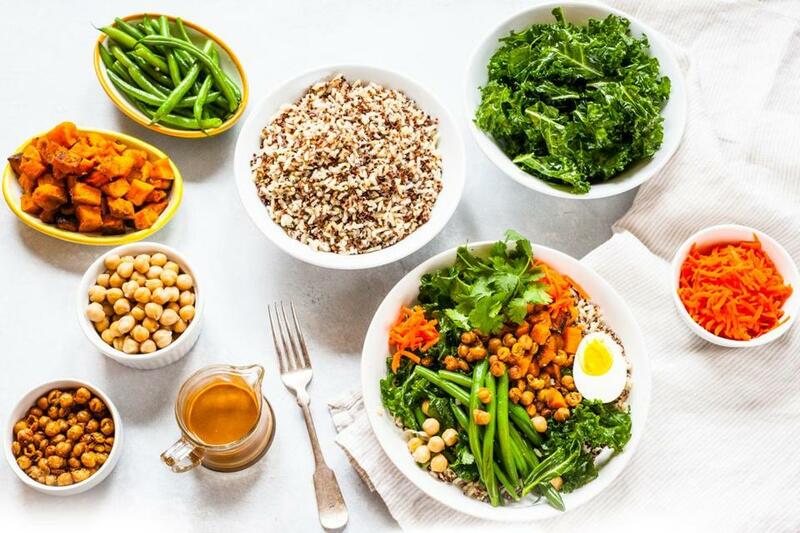 Crispy chickpeas and peanut crumble are just two of the crunchy toppings crowning bowls laden with seasoned roasted vegetables, massaged kale, spicy tofu, pickled carrots, and topped with dressing such as orange miso or creamy harissa. Arnold’s special stamp is on each ingredient, so every single bite has a different flavor or texture. Another popular bowl destination is Bon Me, a play on the Vietnamese sandwich, banh mi. After Patrick Lynch and Ali Fong won the City of Boston’s food truck contest in 2010, they quickly became a sensation with bold Asian cuisine. From the original truck, the duo now has seven fair wage restaurants, eight trucks, and two food carts. Their deep commitment to the local community has spurred them to compost food waste, give benefits to employees who bike or train to work, and support the #FightFor15 movement to decrease the wage gap. “Fresh and fun is how I would describe our offerings,” says Fong, who trained at the Culinary Institute of America in Hyde Park, N.Y. “Transportable food is also key so that it still looks and stays fresh when you bring it home or to the office.” Like similar places, Fong’s offerings are customizable. An online menu shows nutritional values and calorie counts. Protein options include spice-rubbed chicken, Chinese barbecue pork, roasted soy, and paprika tofu. DiSabatino and Arnold are also sure that bowls are going to get more popular. They’re opening two new locations in Cambridge in 2018. Three Washington college students have taken their healthy fast food to eight states with 82 locations, including a December 2017 opening in Post Office Square. In 2007, a month after graduating from Georgetown, Nicolas Jammet, Jonathan Neman, and Nate Ru opened their first Sweetgreens, a Chipotle-style restaurant that features warm grain and vegetable bowls and salads. Jammet’s parents owned the former La Caravelle in New York City, but his vision was different from their fancy food. “We wanted to create a place that celebrates fresh, healthy food and a brand that generates excitement about that,” he says, and one way was to connect to local growers in each location. You’ll notice on the menu board that Ward’s Berry Farm in Sharon provides local Sweetgreens with Hubbard squash, berries, zucchini, and yellow squash. After a month of cookies and eggnog, all of this food is appealing — and filling. And many of the tastes you’ve heard about recently are here: hot chile pastes like the Middle Eastern harissa or Asian gochujang, vegetables that are charred or blistered, and warm creamy dressings with exciting flavors. Rebecca Arnold likes nothing better than to give an unsuspecting carnivore a hefty bowl of vegetables and watch them leave with a big smile on their face.